You can build a new home close to shopping by buying a dilapidated prefab home up north and simply tear it down to build a new home of your choice with no bond to pay. Makes sense as you will have the best of both worlds, shopping and a new home, what else could you ask for. Love Lowes better service and better quality,Plus they take care of veterans all year not just 1 day a year like home depot.For that one reason I stopped shopping Home Depot. I agree. I've always lived in walking distance to "a store." Either a convenience store, or a pizza joint, or an entire street filled with antiques and boutiques, or in my current home, in walking distance to the supermarket and a couple of restaurants. I don't plan on walking every time I want to go to these places, but it's great knowing they're close enough that I *can* if I choose to. It's equally great knowing that I live in a neighborhood that is set away from the main road by a few blocks, so I don't have to deal with the noise and lights and traffic. My preference therefore would be to live perhaps 3-4 blocks from the main drag, and the main drag would be a successful commercial area. And I would bet you don't read the whole thread before posting! There is a map, an up to date map of all of The Villages, available at The Mercantile Store online for five dollars. It is worth every penny of it, especially since you are not here. I studied that map before we came here to look for a home. It is good to make notes on it too. Where some of the classes and activities you might want to do are. I spend a lot of time at Laurel Manor Rec center painting and drawing and crafting, and I am an easy golf cart ride from my doctors and Publix and Winn Dixie and many restaurants. I have driven all over The Villages to play golf and if you do not now play golf, you may change your mind. Golf is free if you walk. Also check where dance and exercise classes are that you may like and discussion clubs or political clubs. 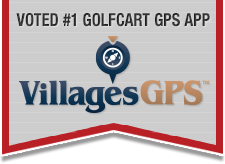 Even if you plan to walk, you would be well served with a golf cart and used ones can be picked up for reasonable prices. We bought a used gas cart when we first moved here and I am still driving it and it is doing well at 15 years of age. Gas carts are cheaper to maintain. Electric cart batteries are expensive.